ANOTHER UPDATE: From Ruth Gledhill at The Times (London) here. PM UPDATE: Interesting article just posted at the London Telegraph entitled: “Britain has become a ‘Catholic Country’ which you can read here. “Roman Catholics have overtaken Anglicans as the country’s dominant religious group. More people attend Mass every Sunday than worship with the Church of England, figures seen by The Sunday Telegraph show. This means that the established Church has lost its place as the nation’s most popular Christian denomination after more than four centuries of unrivalled influence following the Reformation. BB NOTE: We used to use this analogy in the pro-life movement years ago: Let’s say you are standing on the shore of a river and you see a little baby floating by in the river, what would you do? You’d go in and save the little one. Then as soon as you’ve saved that baby, another baby goes floating by so of course, you dive back in and save that baby. But as soon as you are back to shore you turn around and there are more babies floating by in the river and they just keep coming and coming and coming. What do you do now? Well, one would hope you would go up river and see what the hell is going on. Tony Blair has left the Anglican Church and become a Roman Catholic. It has been no secret that one of the major bonds between him and the President of the United States has been their Christian faith. It hasn’t just been a religion of the head, but a faith of the heart. While it’s also been no secret that this change was coming, it still is a very public illustration that many, many faithful Anglicans and Episcopalians are turning to the Roman Catholic Church. When Frank Griswold was Presiding Bishop of The Episcopal Church (and perhaps going back to Edmond Browning his predecessor as well) there was a move away from The Episcopal Church being the “bridge” church between the Roman Catholic and Protestant denominations. The whole “The Episcopal Church Welcomes You” Campaign was one of those grand efforts to show that the Episcopal Church was a bridge church between the denominations. All baptized Christians are welcome at the Eucharist in the Episcopal Church (in the Roman Catholic Church you must be confirmed Catholic and most Protestant Churches are not eucharistically centered). But in the campaign (which followed a clarification in the canons that the Church would count all baptized members, not confirmed members) you do not have to be Episcopalian to be a member of an Episcopal Church, i.e., be welcome at the Table. You must be an Episcopalian to hold office, but not to be a member. The idea is that this would open the doors to Roman Catholics who might be in search of a church home where they would be welcomed not only at the Table but to remarry and remain a full-contributing member in church life. One of the hallmarks of the charismatic renewal in the Episcopal Church (which might differentiate us from our Church of England brothers and sisters) has been the re-emphasis on weekly Sunday Eucharist or the Lord’s Supper in the “renewed” churches – a major step for low-church evangelicals who historically have focused Sunday worship on Morning Prayer. As non-Episcopalian Protestants came in to the Episcopal Church through renewal, they discovered the mystery and the Spirit-filled experience of Eucharistic worship. And for Roman Catholics in exile, they found a familiar home of liturgical worship but with an emphasis on biblical preaching and dynamic music. But the emphasis coming from 815 was that the Episcopal Church would be “Catholic-lite.” It would have all the outer garments of the Roman Catholic Church but sans the stringent dogma, or so they said. This was to be liberating. But it appears that it had the opposite affect. In my home parish it has been an interesting journey to walk through with close friends who have made the decision to become Roman Catholics. They have challenged my assumptions enough to where I can see that there is perhaps more that unites us on some substantial points of doctrine than we have with The Episcopal Church (and hence, a major reason why we have separated). I also learned, through a remarkable and frank conversation I had with the former Bishop of the Rio Grande, is that many Episcopalians have prayed hard and longed fervently that there would be reunion with Rome one day and the Episcopal Church would be an instrument in that work. I pray for unity, but I have never thought about it in terms of a “reunion” as much as a “re-federation,” that one day we would be able to worship in each others churches interchangeably not based on common structures, but on our common Christian faith. It really wasn’t until I sat down and talked with Bishop Steenson this past September in New Orleans that I began to more fully grasp the longing that many Episcopalians have for reunion, that they pray fervently for reunion because in fact, schism is sin. The Episcopal Church was to be an instrument of God in healing that division. When they came to the conclusion that the Episcopal Church would never do that, they realized that they are the ones out in exile and have now gone home. For the first time, I understood that better in my heart. We know about the high-profile leaders like Bishop Steenson, Bishop Hertzog, and Bishop Pope who have left TEC for Rome. Now we learn that Tony Blair, having retired as Prime Minister, has joined them. We know there are other high-profile leaders who are fixing the do the same thing. Are these just isolated experiences, or do they mean something more? It turns out, it seems, that Catholic bishops and priests are among those who stand on the river bank and rescuing believers from drowning. And there are others standing by the river, including a few Anglican Archbishops as well. But why are so many in the river? Perhaps we should – if we haven’t all ready – go up-river and find out. His wife and children are already Catholic and there had been speculation he would convert after leaving office. Cardinal Cormac Murphy O’Connor, who led the service to welcome Mr Blair, said he was “very glad” to do so. Last year, Mr Blair, who is now a Middle East peace envoy, said he had prayed to God when deciding whether or not to send UK troops into Iraq. 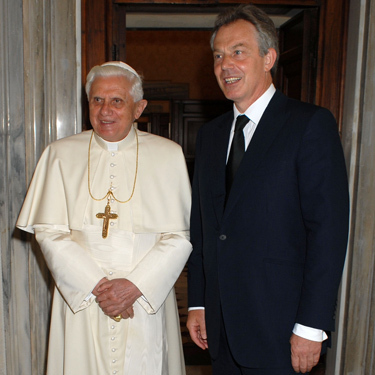 And one of Mr Blair’s final official trips while prime minister was a visit to the Vatican in June where he met Pope Benedict XVI. Mr Blair was received into full communion with the Catholic Church during Mass at Archbishop’s House, Westminster, on Friday. Cardinal Murphy-O’Connor, who is the head of Catholics in England and Wales, said: “I am very glad to welcome Tony Blair into the Catholic Church. “For a long time he has been a regular worshipper at Mass with his family and in recent months he has been following a programme of formation to prepare for his reception into full communion. …Mr Blair’s ex-spokesman, Alastair Campbell, once famously told reporters “We don’t do God,” but has since said that his former boss “does do God in quite a big way”. “In the end, there is a judgement that, I think if you have faith about these things, you realise that judgement is made by other people… and if you believe in God, it’s made by God as well,” he said. This entry was posted in Anglican News, Archbishop of Canterbury, Episcopal News. Bookmark the permalink. What I cannot understand is why people do not go all the way home to the Apostolic faith practiced by the earliest Christians – to the Orthodox Church. I can only believe it is because it is “easier” to become Roman Cathoilic. There are more parishes to choose from. The daily life and disciplines are less difficult. It is not easy to be Orthodox in this society! As Mother Gabriella said, “There are many opportunities to become a Saint in America.”People have a passing knowledge of Roman Catholics – they are protrayed in movies, (the priest in M*A*S*H, the nuns in Sister Act, The Thorn Birds, Monsignor, The Mission, the list goes on and on,) What does Orthodoxy have? My Big Fat Greek Wedding! There is far more than that – there are doctrinal differences that most people are unaware of.To those who long to find home – I beg you to look before you “leap.” Make sure that what you think is “home” is in fact your heart’s TRUE home. If “home” somply means you are comfortable with a liturgy, you can go lots of places – the Lutherans have a good liturgy.But if “home” has something to do with the teachings, of returning to the faith handed down from the Apostles and still practiced, there is only one place to turn.I became convinced of the truth of Orthodoxy before I ever set foot in an Orthodox Church. I had heard that the liturgy was strange to Westerners. Much is based on what the Early Christians did which was taken from Old Testament worship. By the time I went, I knew it didn’t matter. God hadn’t asked me how I should worship Him. I didn’t get a “vote.” Yes, it seemed strange. But it is so beautiful! It all grows on one very quickly when you see it through the eyes of someone seeking the Truth.Just make sure that when you make the move, which ever place you go, you have investigate where you are going and know why you choose one over the other. I am certain that looking objectively at both Roman Catholicism and Orthodoxy, their teachings and the history, you will see the myrid of reasons to go home to Orthodoxy. Most people don’t look that far east. They are like the American pioneers as they traveled west. “This spot looks good, We’ll stop here.” Not realizing that if they’d travel just a little farther, there would be beautiful land. Instead (forgive me) they settled for Western Kansas when they could have had Colorado Springs!Blair is married to a Catholic, It would have been amazing if he’d gone to Orthodoxy and left them in Rome. Don’t think that just because other people become Roman Catholic that is the thing to do. I, too, know a family that went “to Rome,” By he time I found out that they were considering a move, they had closed their minds to any other choice. Okay. I’m off my soap box now. Mary, I am a recent Catholic convert and former Episcopalian (and former member of Truro as well), and I can relate to Bishop Steenson’s take on reunion with Rome. When the time came for me to consider what to do and where to go in the wake of the “recent unpleasantness” in the Episcopal Church, one of the factors that led me to consider seriously the claims of the Catholic Church was a strong conviction that, as you said in your post, “in fact, schism is sin.”Perhaps in part because of my upbringing in the Episcopal Church I have always believed that the visible church is at least as important as the invisible church when it comes to furthering the Gospel and proclaiming the kingdom of heaven. When I surveyed the landscape of protestant Christianity today, with well over 20,000 different denominations, and compared that with Jesus’ prayer to the Father that we might all be one, I was strongly convicted that something wasn’t right here. Ultimately my husband and I were both persuaded that we should do our part to remedy the Anglican schism. I have posted the story on my blog, “Seward’s Folly: Confessions of a Recovering Episcopalian.”Bp. Lee has been fond of saying since 2003 that he prefers heresy to schism because if you have schism you cannot remedy heresy. I have come to agree with him – to a point. Schism makes it difficult, if not impossible, to remedy heresy. Of course, the Episcopal Church was itself born of schism, though that irony seems to have been lost on the good bishop. And perhaps I missed it, but when was the last time the Episcopal Church even attempted to remedy heresy? On the contrary, in my experience they seem to actively encourage it. In contrast, the Catholic Church has, rightly, refused to tolerate either schism or heresy, and they are able to remedy heresy without schism. Orthodox Episcopalians have no other way to address heresy.Since entering the Catholic Church I have found to my great joy how right Chesterton was when he said that “the Church is much larger inside than it is outside.” I have found this to be true even in my own parish church. My prayer is that others will at least dip a toe in the Tiber and find out what the Catholic Church is really all about – in other words, what is going on upstream.